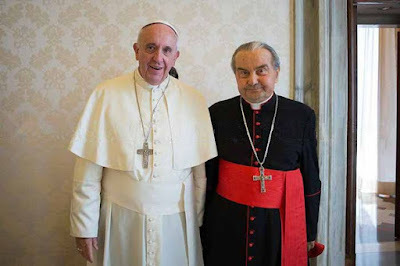 The late Carlo Cardinal Caffarra with Francis. Cardinal Carlo Caffarra died this morning, making him the second of the Amoris Laetitia — Dubia cardinals to pass away, joining Cardinal Joachim Meisner who preceded him on 5 July 2017. This leaves two of the four Dubia cardinals among the living — Burke and Brandmuller. Will Benedict XVI have Abp. Georg Gänswein read another cryptic message at Caffarra’s funeral as he did at Joachim Cardinal Meisner’s? Are these two deaths simply coincidence or are they the result of schemes of a crackpot dictator? 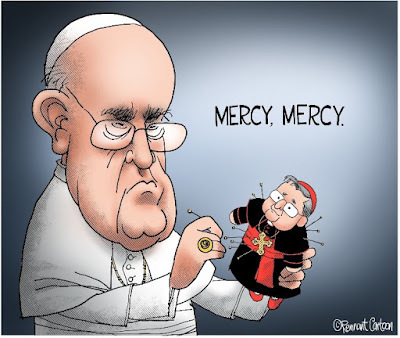 Will Francis ever answer the five dubia? 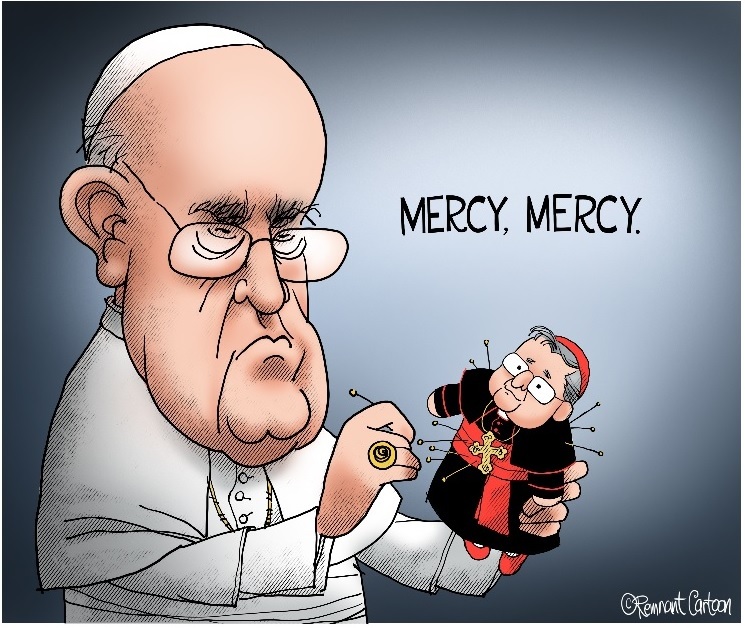 A cartoon from the Remnant Newspaper, which shows Francis performing voodoo on his fellow modernist Cardinal Raymond Burke. It also playfully hints at nefarious goings-on concerning Amoris Laetitia and the five dubia submitted by the four cardinals (Caffarra, Burke, Brandmuller, and Meisner). Not to mention death of Murphy O'Connor. If I were a member of Team B - danneels/mccarrick - would get myself a food taster also. As recently as Monday, lawyers battled in Common Pleas Court as to whether Bevilacqua was competent to testify. The judge stuck to a prior ruling that he was competent to speak. Even though the Novus Ordo is Jewish heresy,I hope this valid priest and highly doubtful "bishop" is in Heaven.